Well I wish I could tell you guys that I spent another glorious weekend partying and hanging out, but what was not the case. One thing I love about living here is all of the options that I have. By options I mean, all of the great things to do in Tampa Bay, or in my case this past weekend, the things not to do! You saw my blog post about last weekend that was spent partying in the trendy South Tampa area of Channelside. This weekend was still spent in another trendy area of South Tampa, called Hyde Park, which is where Jerm resides. My weekend was a blissful 48 hours or so of doing absolutely nothing. On Saturday I went over to the Westshore District and worked out at the soccer fields with a few friends, and then came back to South Tampa to take Miles to the dog park. After that I came home kicked my feet up and opened up the patio doors and let the cool breeze flow in. Sounds relaxing huh! You bet it was. Sunday was more of the same for me as I did even less than before, just opened the patio doors and let the breeze come in. 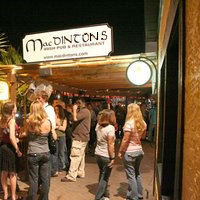 Earlier in the day I did go over to MacDinton&apos;s for a bit to watch the Liverpool vs. Aston Villa, and have an appetizer or two. Never knew that place was a hotbed for football fans as there were plenty of Liverpool fans there to root their team on. It must have worked as Aston Villa was no match for the men from Anfield. I myself am a Manchester United fan, so I was disappointed to see Liverpool win, but what can you do. Long story short, it was a great relaxing weekend and reinforced the fact that while Tampa has tons to offer from attractions, to concert, sports, and museums, you are well within your right to just come down and be lazy!